So maybe you thought about the tool which allows you to open an order at one click. And our product is what you are looking for! It allows preparing a set of "templates" with predefined order parameters (currency, lot size, SL/TP levels, etc) and then open orders according to these parameters at one click in a fast and convenient way! It saves your time on opening orders, you do not have to fill up that "open order" dialog in MT4 terminal. 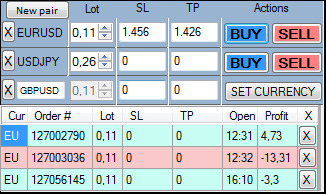 It allows you to set SL/TP levels in pips, then when you click "open order" these pips will be translated into price values. Also the program shows you all opened orders in a compact format, you can freely drag it to other screen and concentrate on your charts on the main screen. Forex Helper is compact and easy to use so just download the program it enjoy the features which it has.